I am not able to repro this issue with site setting invite only enabled (I see that public signups are disabled on your site). @cogdog is there any setting enabled/disabled on your site that may be interrupting invite login flow? Anything that can hep me repro this issue? If the user has already signed up independently, will the bulk invite system detect that and hold back or will they get an invite anyway? If the user (with that email) already exists, they will just be added to the group (if you specified any) and will not receive invite email. This feature is reverted in favour of a security fix. This is a useful feature, but I wonder if it would be possible to send a custom text for Bulk Invitations as well as individual ones. I imagine that, like me, bulk invitations are done to groups of users and there is the possibility that you could also break a large list into smaller targeted lists that are still large enough to justify the bulk procedure, but would benefit from more custom message. I’m not sure if this is a Feature Request or if I have simply missed it. Bulk Invite - Custom Message. Is it possible? 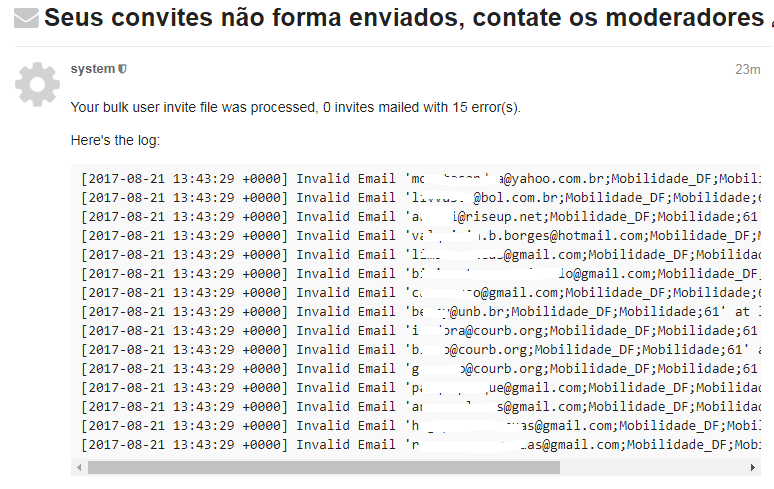 @techAPJ Is it also possible to invite people by giving them code they can enter to find a private forum. For instance, we have a conference in two months, we don’t have the e-mailadresses of the participants which are attending, but we would like to let them use our private forum, is there a way they can enter the forum? Another option would be to let anyone join, but require approval. Yes, that’s what we are going to do. Thanks for the tip. Is there any way of baking some more user settings into the invite link, apart from group membership and topic_id? In particular, I would like to modify the frequency of the summary emails for some invites and setting some categories to watching or watching_first_post would also be great. Oh, and a custom message could also come in handy from time to time. The reasoning behind this is the following: people are generally very reluctant to subscribe follow invite links because they are wary of getting even more emails. Explaining that discourse allows users to control exactly which emails they want to receive is too complicated so I would like to promise invitees something like “You will not receive any emails in you accept the invitation”. Or “You will not receive any emails except those regarding XYZ”. In order to be able to do that, I need to make sure that summary emails are turned off for those users. This functionality would be particularly useful for diverse communities where categories constitute something like sub-forums and where people interested in one category may not be interested in another. In other words, you tell people: “never mind all the other stuff on the forum, we will only get what you want”. I would like to modify the frequency of the summary emails for some invites and setting some categories to watching or watching_first_post would also be great. I am working on an import that has a similar use case. We want to have members of a group auto-follow a given category. There are hundreds of categories and you’re not likely to care about posts in the other categories. We want to hide those categories from the /top and /latest, but somehow make sure that group members notice posts in their categories. We want to have members of a group auto-follow a given category. If that’s true, it’s a bug. Create a simple cvs file that demonstrates it, one that you can include in your bug report, and create a new thread in the #bug category. After I changed ; to , all worked fine! I see an opportunity to improve here @techapj, if we see a line with zero commas, you should terminate the entire process and warn the user the file does not appear to be a comma delimited CSV file at all. I had a moderator have an issue with a bulk invite earlier as well. He couldn’t understand what was wrong and couldnt explain it properly. I just ran his file thru a simple converter then it worked fine. It’d be really nice if it showed what was going to happen, perhaps just with the first few lines, before diving in and doing it. That’d show the user whether the file was usable or not before it potentially did the wrong thing. Where do I find the above settings? Maybe the import code could be made to cope with extraneous spaces?